A white fluffy coat and J Brand charlin jeans are absolute staples if you're crafting an off-duty wardrobe that holds to the highest fashion standards. Make your look more fun by completing it with tan slip-on sneakers. 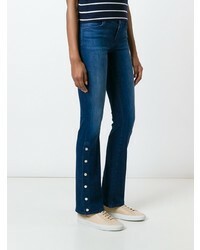 If you're looking for a casual yet totally stylish getup, try pairing a tan crew-neck t-shirt with blue flare jeans. Both garments are totally comfy and will look fabulous paired together. You could perhaps get a little creative in the footwear department and dress up your outfit with beige leather pumps. If you're on a mission for a casual yet absolutely chic getup, try teaming a navy tweed jacket with J Brand charlin jeans. Both garments are totally comfy and will look fabulous together. When it comes to shoes, this look is round off nicely with black suede pumps. If you're in search of a casual yet totally stylish outfit, choose a green horizontal striped turtleneck and J Brand charlin jeans. Both items are totally comfy and will look fabulous together. Sporting a pair of dark green embellished suede pumps is a simple way to add some flair to your ensemble. If you're looking for a casual yet totally stylish outfit, opt for a blue denim biker jacket and J Brand charlin jeans from farfetch.com. Both pieces are totally comfy and will look fabulous paired together. Amp up the cool of your ensemble by finishing off with tan suede ankle boots. 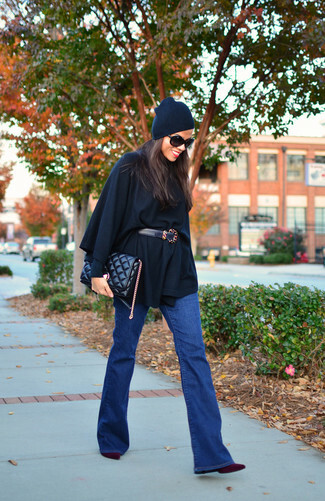 If you're after a casual yet totally chic getup, team a black poncho with blue flare jeans. Both pieces are totally comfy and will look fabulous together. Up the cool of your outfit by finishing off with dark purple suede ankle boots. 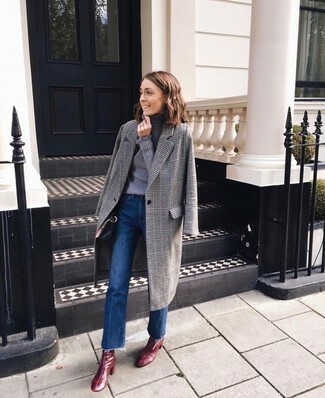 If you don't like getting too predictable with your outfits, opt for a grey plaid coat and J Brand charlin jeans. You could perhaps get a little creative when it comes to footwear and lift up your outfit with burgundy leather ankle boots. 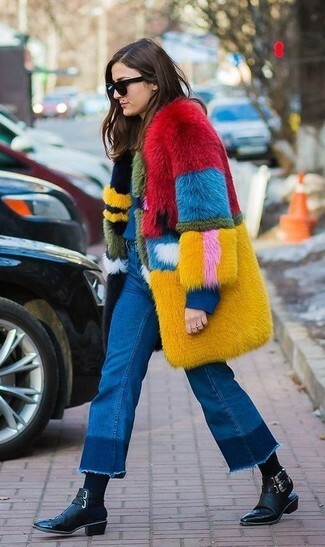 For a killer-meets-stylish ensemble, rock a multi colored fur coat with J Brand charlin jeans — these pieces go nicely together. As for the shoes, choose a pair of black leather ankle boots. Parade your expert styling by wearing this casual combination of a grey coat and J Brand Charlin Jeans from farfetch.com. A cool pair of white low top sneakers is a simple way to infuse a touch of playfulness into your ensemble.